The site consists of 21 acres with no structures present. The former use of the Lamay site was agricultural purposes. 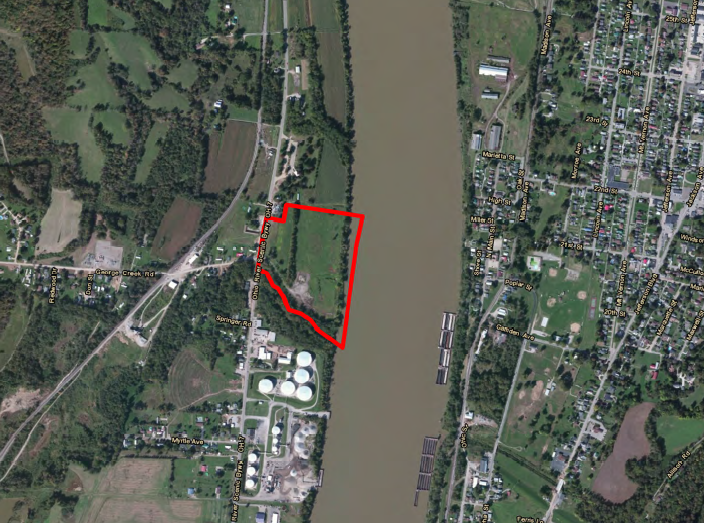 The site is currently zoned for commercial and industrial use with a permit in place allowing direct loading and unloading of non-hazardous waste along the 1,650 feet of Ohio River frontage. The topography of this site is level and gently rolling. The topography of this site is level and gently rolling. According USDA NRCS, there are six soil types mapped for the site. The two dominant soil types that were mapped are Dumps-Mine (Dm – 6.3 acres, 24.8 percent of the site) and Nolin silt loam (No – 7.5 acres, 29.4 percent of the site). The USFWS NWI map for the Lamay Site shows a stream located on the southwest portion of the property. 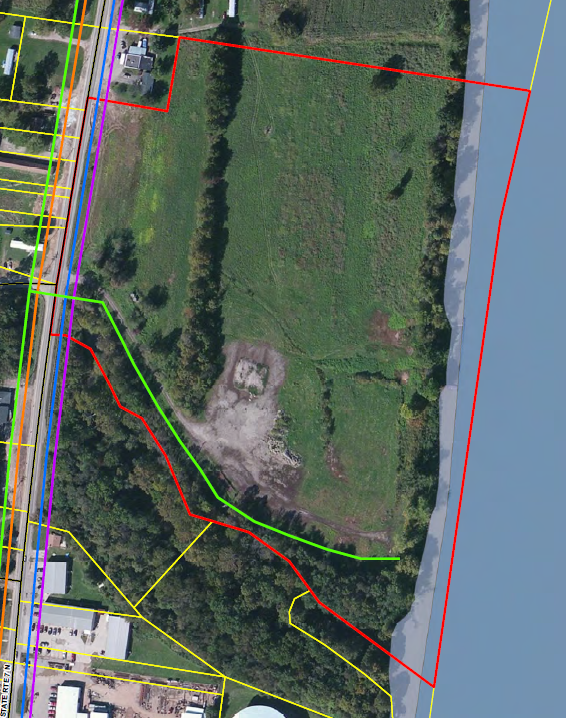 This stream is shown as R3UBH – Riverine/Upper Perennial/Unconsolidated Bottom and totals 1.78 acres. Currently there is one an unimproved road that accesses the site off of Ohio SR 7. This access road is located at the intersection of Georges Creek Road and Ohio SR 7. The existing roadway surfacing comprises of gravel and soil. 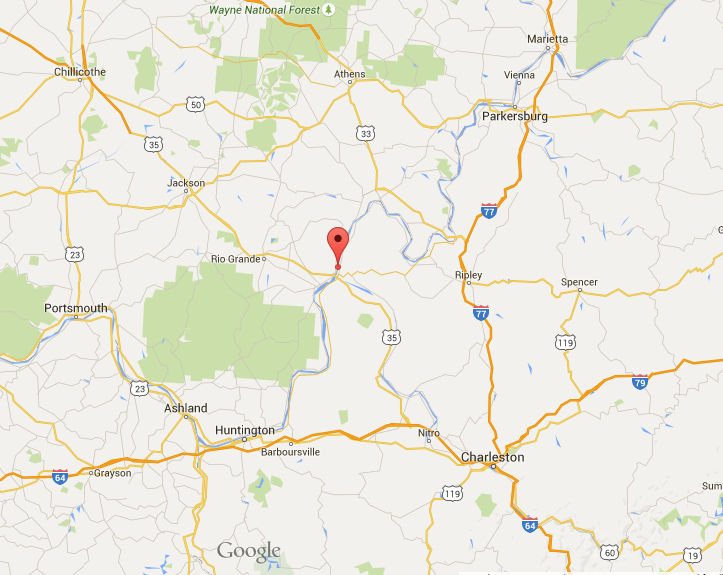 This site is located 2 miles from US-35 and 40 miles from Interstate 77. Permitted river access does exist. The permit allows the loading and unloading of nonhazardous materials and fleeting. The permit also allows for 2,400 lineal feet (lf) of additional docking along the adjacent West Virginia riverbank. In addition, the additional docking allows for a width of six barges. Docking structures exist along the West Virginia riverbank for barge tie off. The Huntington Tri-State Airport is located 53 miles from this site, and the Yeager Regional Airport is 63 miles from the site. 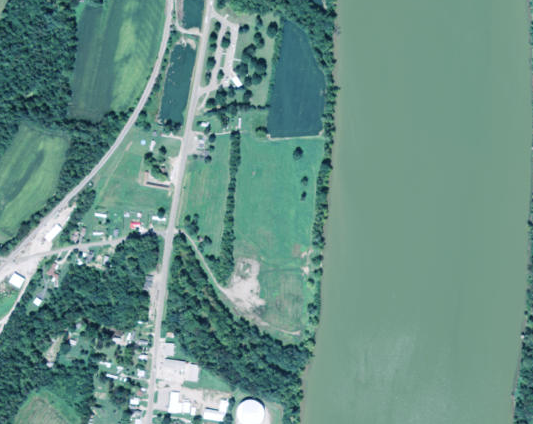 The Lamay Site is located near Ohio River Mile 264, which has normal pool elevations of approximately 538 feet amsl. Currently the electric service is provided by AEP. Electric service runs along both the east and west sides of Ohio SR 7. Three-phase electric power did previously exist on site for barge unloading operations, but all electric power service into the site has been terminated. Electric utility poles, wiring, transformers, and breaker boxes still exist on site. AEP 12kV service is located on site and along SR 7. AEP 138kV and 69kV facilities are located 0.4 miles west of the site. Potable water service is provided by Gallia County Rural Water. A 12-inch potable water line with 100 psi exists on the east side of Ohio SR 7. No water service piping currently exists on the site. Currently the storm drainage sheet flows towards the Ohio River. The confluence of George Creek and the Ohio River is located along the south side of the site.